On the run up to Poppy being born we were busy renovating and decorating our spare room for Isabella to move into. It wasn't a simple paint job (nothing ever is with old houses it seems! ), a new ceiling had to be put in, whole room wallpapered, window repaired, holes filled, new carpet put in and the standard wall/wood work painted too. Of course, this could have been done at a leisurely rate but the impending birth of our Poppy meant there was no such luxury. As I was pretty useless when it came to getting involved (large baby bumps make almost everything DIY related an impossible task), so I turned my attention to much smaller crafty DIY projects I actually could do. 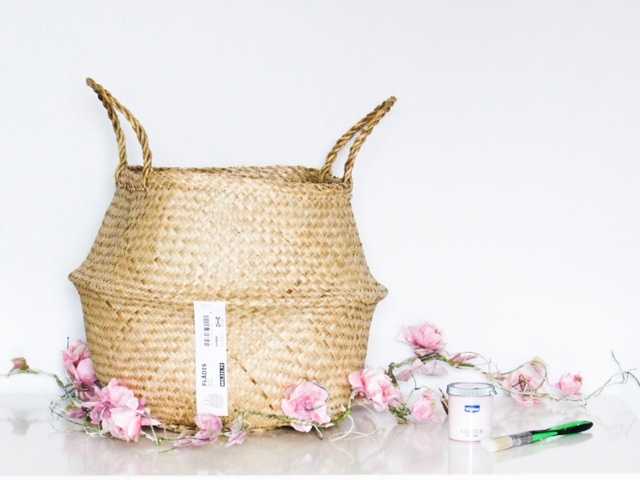 One of my favourite DIY projects has been jazzing up this seagrass basket from IKEA and for such an affordable price too. 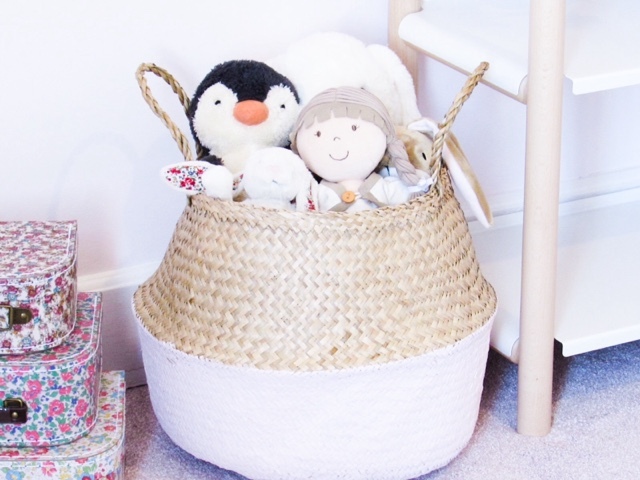 You may have seen in my 'TODDLER: Big Girl Bedroom Wishlist' blog post that I featured a Rose Seagrass Basket. 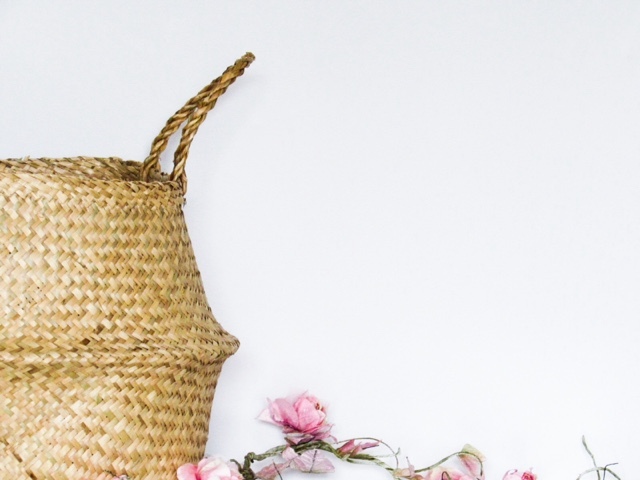 This style of basket is everywhere at the moment and I love it! But at most on the market edging upwards of £30 it is more of a luxury/treaty purchase. 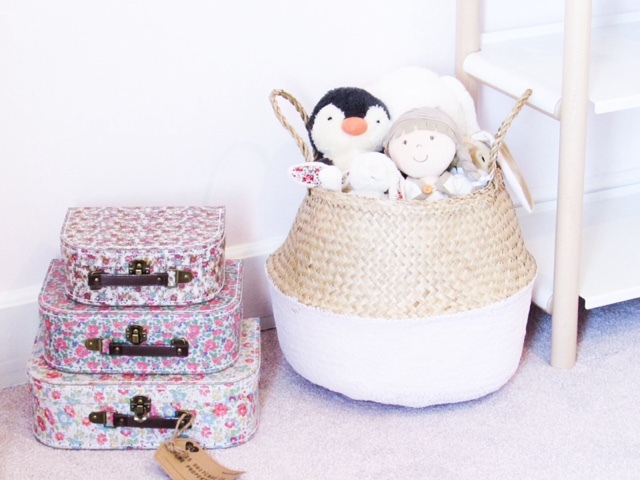 So when I spotted this seagrass basket in IKEA for only £9 I couldn't resist trying to add my own DIY touch. As I frantically tried to google 'DIY Seagrass Basket' in the depths of IKEA I soon realised the 'no service' sign on my phone meant I was on my own. Would it work? Would it not? Feeling confident I could 'have a go' in it went into the trolley and off I waddled (again, a pregnancy related joy) imagining what colour I should go for to compliment Isabella's new bedroom. Originally I was going to save the painting of the basket for a nap time or a day when I was on my own during maternity leave, but I couldn't resist. Isabella's apron went on, as did mine and we got painting together. A proper mummy and daughter team effort and I couldn't be happier with the results! It was honestly so easy to do, I mean my two year old daughter did a lot of it and it helped to get her involved/excited about moving into her 'big girl' room too. Win, win. For the paint I really didn't want to go and buy yet more, our cellar is rivalling the paint aisle in Wickes we have that many tester pots/pots of paint. 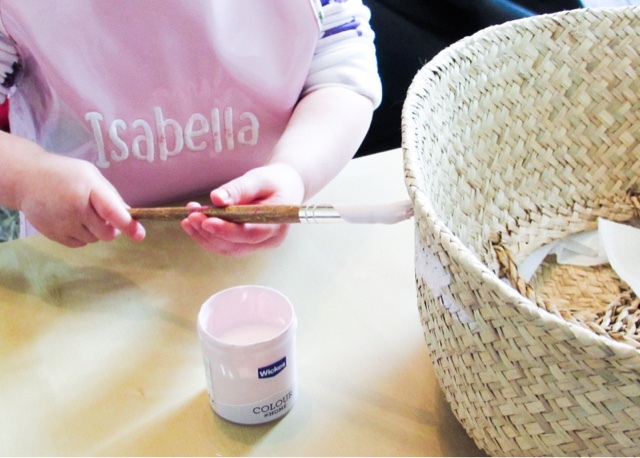 As we had only recently been trialling a variety of pinks for Isabella's bedroom we had a fair few tester pots around, ready and waiting to be used. When it comes to paint I have commitment issues, it always seems to permanent so I get scared and can never decided. Anyone else like that? I have the same issue when it comes to fixing things permanently to the walls - it makes me nervous. 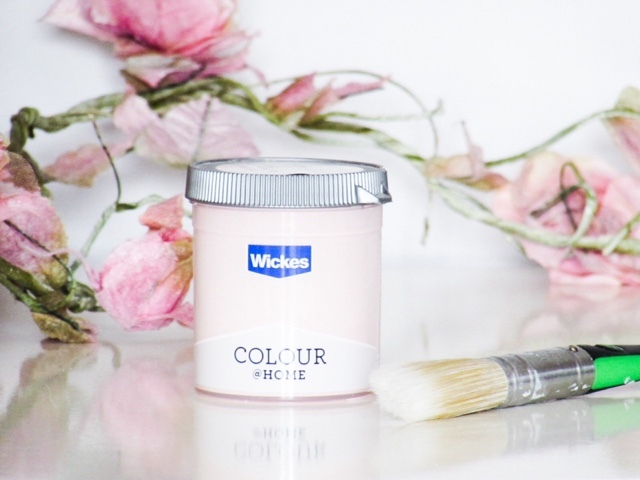 Anyway I finally settled on Poetic Pink from Wickes because it was one of the colours we almost painted her whole room in and was slightly darker pink compared to all the other tester pots. I don't remember exactly the price of a Wickes tester pot, but we're talking certainly no more than £2. 1) Open up the basket so it is standing up straight (the ones in IKEA come with the top half folded inwards). 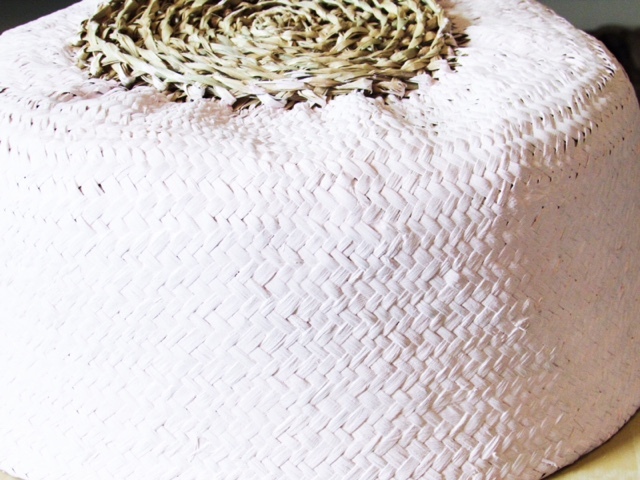 Break off a long line of kitchen roll and wrap around the inside of the bottom half of the basket. This is to stop any paint that goes through the small gaps transferring onto the top half of the basket. Then push the top half back into the basket, so you only have the bottom half showing. (This is tricky to explain, but will hopefully make sense when you have the seagrass basket in front of you). 2) You could also add a line of masking tape around the fold, as this will create a very neat line between the painted and non-painted sections. You are then ready to start painting - I didn't mix the paint with water. Just simply opened the tester pot up and starting painting. 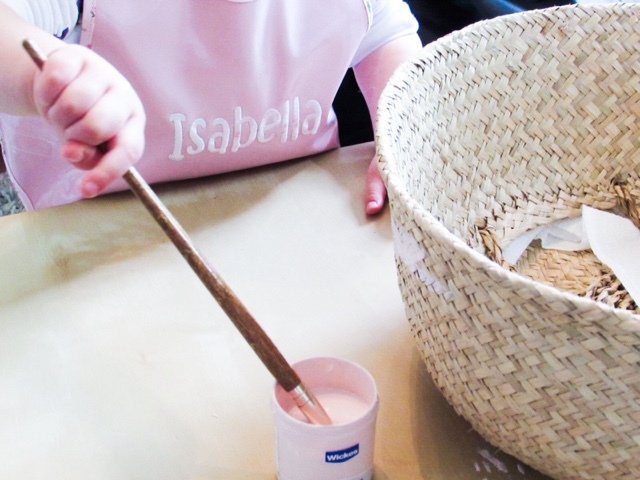 Make sure you move the paintbrush in all directions, as you want to try and get in-between the weave of the basket. 3) I did one coat all the way around, flipped the basket upside down to paint the bottom (though the circle on the very bottom I left unpainted due to the amount of paint I had left) and then left to dry. 4) Once completely dry I painted another layer on and left to dry. 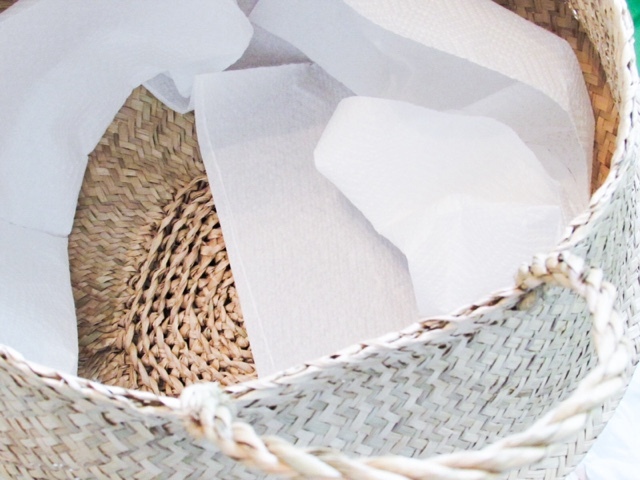 5) Open up the basket again, remove the kitchen roll and it is ready to be used. I've also seen these with pom-poms attached around the top, which looks beautiful or you could attach the string of flowers from Sass & Belle that you can see in the pictures above. You do have to be careful not to knock/bend the painted part too much as the paint can come off. Isabella happily puts her cuddly toys in and out without an issue though. What colour would you paint the bottom half and which room would you put it in? Oh I love this! I had no idea you could paint a basket!! I have so many baskets I could paint right now...off to buy paint!!!! I'm totally doing this - I think it would be a lovely activity to do with Max and the perfect touch to his new room! What a great idea and love that your daughter joined in to help - looks lovely! Such a cute idea I love how easy it is to do and it makes a difference to basket in a simple way. Love that your daughter joined in helping. Saw this on your Instagram, so was very happy to read up on how to do it! I too can feel your pain on big bumps! If probably paint it turquoise and have it in my living room. Your basket looks beautiful. Old houses are the best! What a fantastic idea! I bet bright colours and attaching pom pins would look cool as well! Such a cute idea, and so simple, off to pin! This is a lovely idea to do with your little one! I can't wait to do the same! Looks fab, would never have though to paint one of thise baskets. This looks lovely in Isabella's room and I bet she loved getting to help with it. I love the shape of the basket, very unusual. 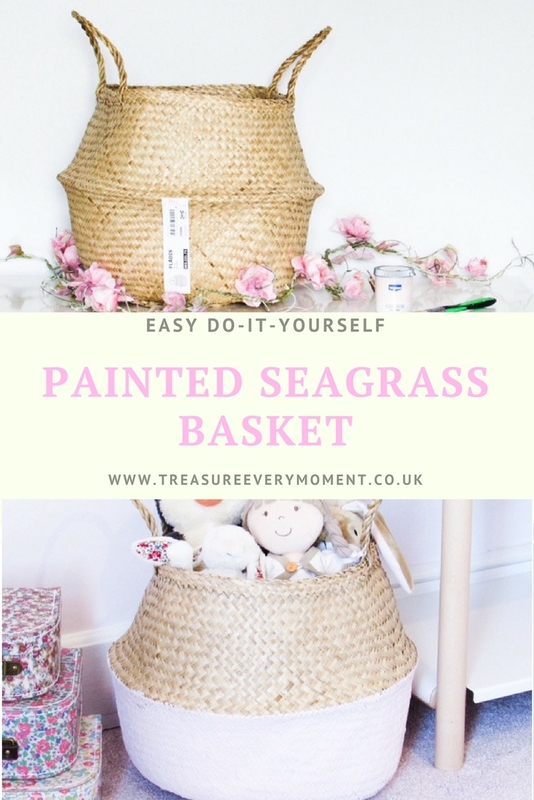 What a great idea to add some colour to it to compliment the room, i never would have thought to paint seagrass but now i am thinking how i can upcycle all my seagrass baskets around the house!